Jacob Boutilier of the NDSS Golden Hawks jumps to finish a return during Thursday's KASSAA league game. Photo by Adam Prudhomme. 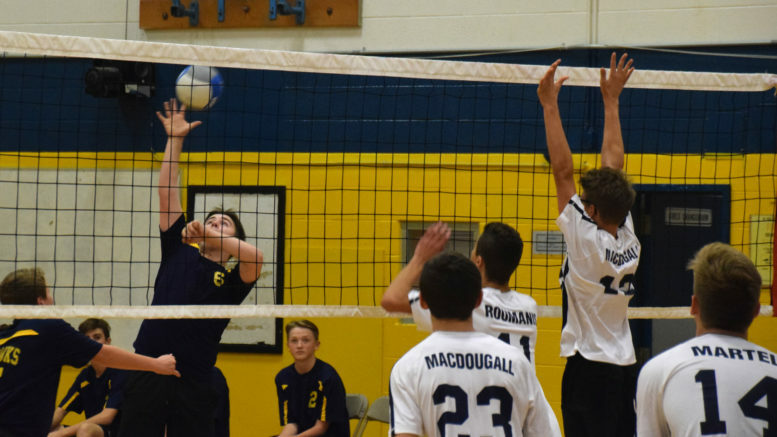 No matter what the NDSS Golden Hawks junior boys’ volleyball team tried, they just couldn’t catch the Marie-Rivier Dragons in the must-win fourth set during Thursday’s KASSAA league game, played at NDSS. The Hawks rallied several times but just couldn’t find a way to tie or even pass the Dragons, ultimately falling 25-22 in the fourth set, dropping the game 3-1 overall. The Dragons, already up two sets to one in the game, jumped out to a 10-5 and 14-8 lead in the fourth set. Napanee turned to the serves Scott Collard and Braden Bannon to go one two separate runs to close the gap to 14-11 and 17-16. The two teams continued to trade points with Napanee never able to complete the comeback, coming closest at 19-18 before the Dragons went on three point run to help seal the win. Napanee battled the Dragons tough in three of four sets, losing the first one 25-21 and winning the third 25-16. Only the second was an aberration, with the Dragons cruising to a 25-8 win. He says the third and fourth sets were more indicative of their playing capabilities. “We were a lot more confident and we were rolling with it,” Vallier said of the last two sets. The loss dropped Napanee to 2-5 on the year while the Dragons improved to 2-2, drawing even with the Hawks in the KASSAA league standings at seventh, each with two points. Despite the loss, the Hawks are still in a good position to secure a playoff spot with three games left to play. They’ll look to get back on the winning track Thursday afternoon when they host the LCVI Lancers. Napanee will need at least an eighth place finish to qualify for the playoffs. A playoff trip would provide a nice bit of experience for the young club, which is made up of all but three rookie Grade 9 players. Meanwhile NDSS’ football teams’ playoff hopes were dealt a huge blow on Friday afternoon as they both dropped close games to the Ernestown Eagles. For a second week in a row the seniors had a last minute attempt to steal a win, but came up short in a 19-14 loss. The junior team meanwhile played their most competitive game of the year, but also wound up a touchdown short in a 17-12 loss. Both teams remain winless on the year. They’ll each take on the KCVI Blues this Thursday, in a game played at LCVI. The seniors kick off at 1 p.m., followed by the juniors at 3 p.m.
On the basketball court the Golden Hawks senior girls picked up a 32-18 win over Ernestown to move to 2-4, moving them to a tie for fifth. The juniors were also victorious, winning 42-28 over Ernestown for their first win of the season.